There are now officially only eight planets in our solar system (in 2006 the International Astronomical Union changed the definition of 'planet' so that Pluto no longer qualifies). The Solar System consists of the Sun and the other celestial objects gravitationally bound to it: eight planets, their 165 known moons, three dwarf planets (including Pluto) and their four known moons, and billions of small bodies (which includes asteroids, comets, meteoroids). In order of their distances from the Sun, the planets are Mercury, Venus, Earth, Mars, Jupiter, Saturn, Uranus, and Neptune. Six of the eight planets are in turn orbited by moons. All the planets except Earth are named after gods and goddesses from Greco-Roman mythology. The Sun is by far the largest object in the solar system. It is the star at the center of the Solar System. The Earth and other matter (including other planets, asteroids, meteoroids, comets and dust) orbit the Sun. Energy from the Sun (sunlight) supports almost all life on Earth via photosynthesis, and drives the Earth's climate and weather. The Sun contains more than 99.8% of the total mass of the Solar System (Jupiter contains most of the rest). At present, the mass of the Sun is about 70% hydrogen, 28% helium by mass, other metals amount to less than 2%. This changes slowly over time as the Sun converts hydrogen to helium in its core. 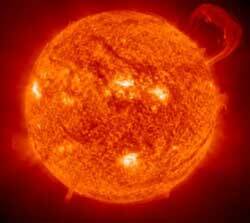 The Sun's energy output (3.86e33 ergs/second or 386 billion billion megawatts) is produced by nuclear fusion reactions. As it travels out toward the surface, the energy is continuously absorbed and re-emitted at lower and lower temperatures so that by the time it reaches the surface, it is primarily visible light. Mercury is the innermost and smallest planet in the solar system, orbiting the Sun once every 88 days. It can only be seen in morning or evening twilight. Physically, Mercury is similar in appearance to the Moon as it is heavily cratered. It has no natural satellites and no substantial atmosphere. The planet has a large iron core which generates a magnetic field about 0.1% as strong as that of the Earth. 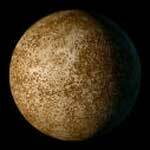 Mercury is one of the four terrestrial planets, being a rocky body like the Earth. It consists of approximately 70% metallic and 30% silicate material. The density of the planet is the second-highest in the solar system at 5.43 g/cm³, only slightly less than Earth’s density. 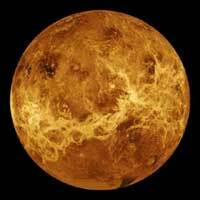 Venus is the second planet from the Sun and the sixth largest. Venus' orbit is the most circular of that of any planet, with an eccentricity of less than 1%. Venus (Greek: Aphrodite; Babylonian: Ishtar) is the goddess of love and beauty. The planet is so named probably because it is the brightest of the planets known to the ancients. The phases of Venus can be viewed with a telescope from Earth. Galileo's observation of this phenomenon was important evidence in favor of Copernicus's heliocentric theory of the solar system. Venus' rotation is very slow (243 Earth days per Venus day). In addition, the periods of Venus' rotation and of its orbit are synchronized such that it always presents the same face toward Earth when the two planets are at their closest approach. * Venus is only slightly smaller than Earth (95% of Earth's diameter, 80% of Earth's mass). * Both have few craters indicating relatively young surfaces. * Their densities and chemical compositions are similar. Earth is the third planet from the Sun and the fifth largest. 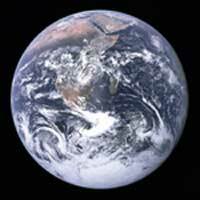 Home to the human species, it is also referred to as "Planet Earth", "Gaia", "Terra", and "the World". 71% of the Earth's surface is covered with water. The Earth is the first planet known to have liquid water on the surface and is the only place in the universe known to harbor life. The heat capacity of the oceans is also very important in keeping the Earth's temperature relatively stable. The Earth formed around 4.57 billion years ago. At present, the Earth orbits the Sun once for every 366.26 times it rotates about its axis (which is equal to 365.26 solar days). The Earth's axis of rotation is tilted 23.5° (away from the perpendicular to its orbital plane), producing seasonal variations on the planet's surface. The Earth is divided into several layers which have distinct chemical and seismic properties. The crust varies considerably in thickness, it is thinner under the oceans, thicker under the continents. Unlike the other terrestrial planets, Earth's crust is divided into several separate solid plates which float around independently on top of the hot mantle below. The Earth's atmosphere is 77% nitrogen, 21% oxygen, with traces of argon, carbon dioxide and water. Earth has a magnetic field that, together with a primarily nitrogen-oxygen atmosphere, protects the surface from radiation that is harmful to life. The Moon makes a complete orbit around the Earth every 27.3 days, and the periodic variations in the geometry of the Earth - Moon - Sun system are responsible for the lunar phases that repeat every 29.5 days. The gravitational attraction, and the centrifugal forces generated by the rotation of the Moon and Earth around a common axis, the barycentre, is largely responsible for the tides on Earth. 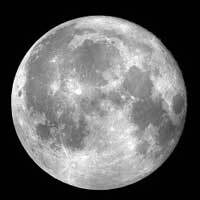 The Moon is the only celestial body that humans have travelled to and landed on. The US Apollo program has achieved the first (and only) manned missions to date, resulting in six landings between 1969 and 1972. The Lunar phase refers to the appearance of the illuminated portion of the Moon as seen by an observer on Earth. The Moon exhibits different phases as the relative geometry of the Sun, Earth and Moon change, appearing as a full moon when the Sun and Moon are on opposite sides of the Earth, and becoming invisible as a new moon (also named dark moon) when they are on the same side. 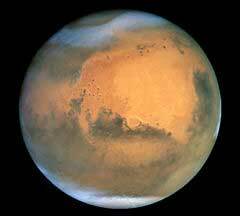 Mars has a thin atmosphere and some of the most varied and interesting terrain of any of the terrestrial planets. It is the site of Olympus Mons, the highest known mountain in the solar system, and of Valles Marineris, the largest canyon. In addition to its geographical features, Mars’ rotational period and seasonal cycles are likewise similar to those of the Earth. Of all the planets in our solar system, Mars is the most likely, other than Earth, to harbor liquid water, and perhaps life. Mars can be seen from Earth with the naked eye, a brightness surpassed only by Venus, the Moon, and the Sun (and at times Jupiter). Jupiter is the fifth planet from the Sun and by far the largest. Jupiter is more than twice as massive as all the other planets combined (the mass of Jupiter is 318 times that of Earth). Jupiter is the fourth brightest object in the sky (after the Sun, the Moon and Venus). In 1610 Galileo first pointed a telescope at the sky and discovered Jupiter's four moons Io, Europa, Ganymede and Callisto (now known as the Galilean moons) and recorded their motions back and forth around Jupiter. This was the first discovery of a center of motion not apparently centered on the Earth. 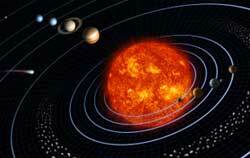 It was a major point in favor of Copernicus's heliocentric theory of the motions of the planets. Jupiter, along with Saturn, Uranus, and Neptune, is classified as a gas giant. It is not primarily composed of solid matter but is 93% hydrogen and 7% helium; it may also have a rocky core of heavier elements. Because of its rapid rotation the planet is an oblate spheroid (it possesses a slight but noticeable bulge around the equator). Galileo was the first to observe it with a telescope in 1610; he noted its odd appearance but was confused by it. 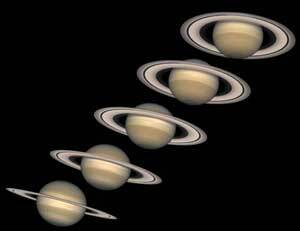 Early observations of Saturn were complicated by the fact that the Earth passes through the plane of Saturn's rings every few years as Saturn moves in its orbit. A low resolution image of Saturn therefore changes drastically. It was not until 1659 that Christiaan Huygens correctly inferred the geometry of the rings. Like Jupiter, Saturn is about 75% hydrogen and 25% helium with traces of water, methane, ammonia and "rock". Two prominent rings (A and B) and one faint ring (C) can be seen from the Earth. Though they look continuous from the Earth, the rings are actually composed of innumerable small particles each in an independent orbit. They range in size from a centimeter or so to several meters. The rings are extraordinarily thin: though they're 250,000 km or more in diameter they're less than one kilometer thick. The ring particles seem to be composed primarily of water ice, but they may also include rocky particles with icy coatings. When it is in the nighttime sky, Saturn is easily visible to the unaided eye. Though it is not nearly as bright as Jupiter, it is easy to identify as a planet because it doesn't 'twinkle' like the stars do. The rings and the larger satellites are visible with a small astronomical telescope. Uranus named after the Greek god of the sky, is the seventh planet from the Sun. 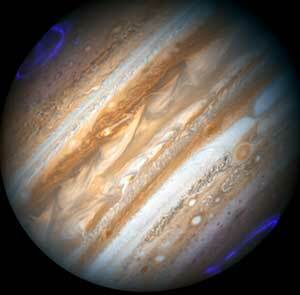 It is a gas giant, the third largest by diameter and fourth largest by mass. Uranus, the first planet discovered in modern times, was discovered by William Herschel while systematically searching the sky with his telescope on March 13, 1781. Most of the planets spin on an axis nearly perpendicular to the plane of the ecliptic but Uranus' axis is almost parallel to the ecliptic. At the time of Voyager 2's passage, Uranus' south pole was pointed almost directly at the Sun. 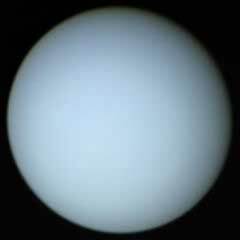 This results in the odd fact that Uranus' polar regions receive more energy input from the Sun than do its equatorial regions. Uranus is nevertheless hotter at its equator than at its poles. Uranus is composed primarily of rock and various ices, with only about 15% hydrogen and a little helium. Its atmosphere is about 83% hydrogen, 15% helium and 2% methane. Neptune is the eighth and farthest known planet from the Sun in the Solar System. It is the fourth largest planet by diameter and the third largest by mass; 17 times the mass of Earth. The planet is named after the Roman god of the sea. Neptune's atmosphere is primarily composed of hydrogen and helium, with traces of methane that account for the planet's blue appearance. Neptune's blue colour is much more vivid than that of Uranus, which has a similar amount of methane, so an unknown component is presumed to cause Neptune's intense colour. Neptune's temperature at its cloud tops is usually close to -218 °C, one of the coldest in the solar system, due to its long distance from the sun. However, Neptune's centre is about 7,000 °C (13,000 °F), hotter than the sun's surface. This is due to extremely hot gases and rock in the center. After the discovery of Uranus, it was noticed that its orbit was not as it should be in accordance with Newton's laws. It was therefore predicted that another more distant planet must be perturbing Uranus' orbit. 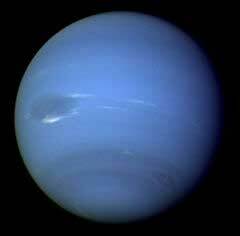 Neptune was first observed by Galle and d'Arrest on 1846 Sept 23 from mathematical calculations. Poor Pluto is no longer considered a planet in our solar system. Pluto orbits beyond the orbit of Neptune. It is much smaller than any of the official planets and now classified as a "dwarf planet". In Roman mythology, Pluto (Greek: Hades) is the god of the underworld. Pluto was discovered in 1930 by accident. Calculations which later turned out to be in error had predicted a planet beyond Neptune, based on the motions of Uranus and Neptune. Not knowing of the error, Clyde W. Tombaugh at Lowell Observatory in Arizona did a very careful sky survey which turned up Pluto. After the discovery of Pluto, it was quickly determined that Pluto was too small to account for the discrepancies in the orbits of the other planets. The search for Planet X continued but nothing was found. Pluto's orbit is highly eccentric. At times it is closer to the Sun than Neptune (as it was from January 1979 thru February 11 1999). Pluto rotates in the opposite direction from most of the other planets.